The Spring 2016 Joint ArizMATYC and MAA – Southwest Conference is scheduled for Friday, April 8 (8:00AM – 4:30PM) and Saturday, April 9 (8:00am – 11:00am) at Coconino Community College in Flagstaff, Arizona. 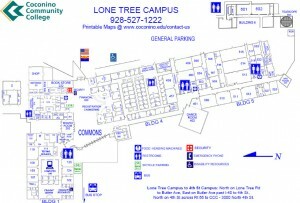 The campus is located at 2800 South Lone Tree, Flagstaff, AZ 86005. Registration for the conference is $30. The cost of the Friday evening banquet is $35 (banquet is optional). The banquet will be held from 6-9PM at the High Country Conference Center (201 West Butler). There will be three choices of entree. You can choose your entree on the registration form above and also purchase extra tickets to the banquet. ArizMATYC and the MAA Southwestern Section encourages you to submit a proposal to present at the conference. Sessions are scheduled for 50 minutes with 5-10 minutes of questions. Students are also encourage to submit a proposal. Student proposals are 25 minutes with 5 minutes for questions. Students desiring to present a 50 minute proposal should submit a proposal for a regular session. The deadline for submitting a proposal is March 18. You will receive a confirmation email within five days of submitting the proposal. Several vendors will be available at the conference. Potential vendors should contact Barbara Boschmans (Barbara.boschmans@nau.edu). Vendors may purchase tables ($100 or $175) or a presentation ($100). Sponsorship is also available for the conference. Vendors should follow the link below to register and pay for conference services. Call to reserve and mention “MAA/SW Regional Conference” as part of your reservation to receive a conference rate of $149.00 for a king or double queen room. Call to reserve and mention “MAA Regional” as part of your reservation to receive a conference rate of $159 per room. The room reservations must be made by March 7th before the held rooms are released. The conference organizer is Brian Beaudrie (Brian.Beaudrie@nau.edu) or Shannon Guerrero (Shannon.Guerrero@nau.edu). For questions about this page, contact webmaster@arizmatyc.org .